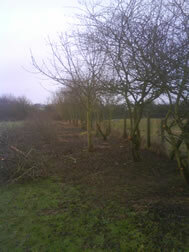 In preporation for the local scout group to plant 600 whips to form a new boundary hedge, the old hawthorn bushes had to be removed and the crowns lifted on the remaining 30 trees so that the scouts had clearance around the trees. 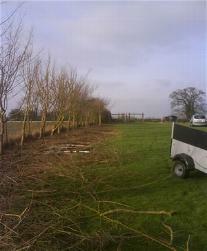 The newly planted hedge, around the whole perimeter of the playing field, began to suffer during the heat wave we had in early 2010. Special watering sessions were required using a 100 metre hose in order for the hedge whips to survive and flourish. The hedge is now growing well and the whips are approximately 4 feet high.